Houseplants get their nutrients from quality potting soil. It can be purchased at garden centers or mixed at home. Numerous soil amendments, lime for example, are available to suit the needs of specific plant species. Dolomitic lime is a form that, like others, adjusts soil pH, but it also addresses specific houseplant deficiencies. Dolomitic lime contains calcium carbonate and magnesium carbonate. It is derived from limestone. Its quality varies between manufacturers, which allow different amounts of contaminants like clay. Dolomitic lime raises the pH of houseplant soil, thereby making it more alkaline. This is necessary because potting soils containing high levels of peat can be acidic. Houseplants prefer a neutral pH of 7. Meters that measure pH are an important tool for the home gardener. Dolomitic lime will correct a potting soil that has a magnesium deficiency. This is vital for photosynthesis, the process by which plants make food. First it supplies magnesium, and then it makes existing magnesium possible to absorb. When soil becomes too acidic, plants are not able to absorb magnesium or other nutrients. Their leaves fade and growth is minimal. Blooming houseplants will fail to do so. 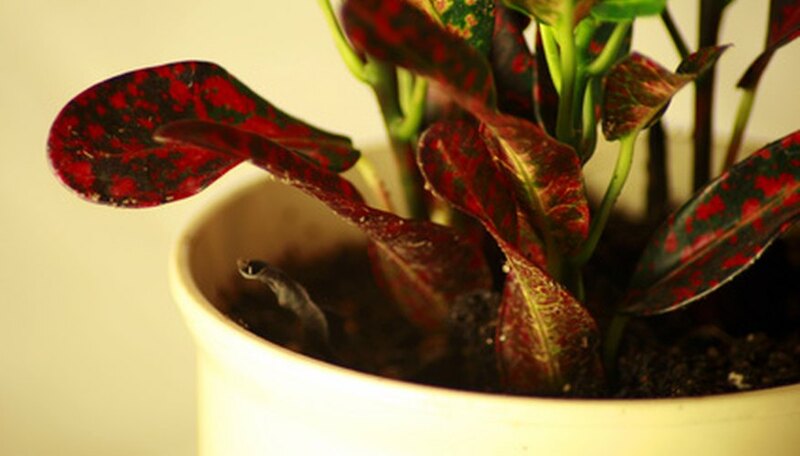 Houseplants show magnesium deficiencies specifically on older leaves, and it appears in stages. First leaves are light green. Leaves then show yellowing along veins and edges. This can be confused with lack of iron. Finally, the edges curl and turn purple. Dolomitic lime is often sold in a pelletized form, which is absorbed more slowly than powdered limes. Apply at least three months before the growing season so that it will be available when houseplants need it. While faster-absorbing limes are available for use on houseplants, they are not recommended due to their propensity to burn the plant. A rule of thumb is the faster the variety of lime is absorbed, the easier it can burn you or your plant. Burning is especially a problem with builder's lime. Dolomitic lime is not as harsh as other forms, but follow safety warnings on the label. Wear gloves and avoid applying it where it is likely to become airborne. Follow label directions specific to houseplants. Rates depend on the soil's starting pH and the size of the container. One tsp. can be added every one or two months to counter leaf-browning due to hard water. Do pH tests frequently so that soil does not become too alkaline over time. Christine Lucas has been a freelance writer for four years and writes a parenting column for The Savannah Morning News called Rattled. Previously, her work has been on gardening. Lucas has written for "Lawn & Garden Retailer," "Southern Families," and "Georgia Gardening." She holds a Bachelor of Fine Arts in photography from the University of Delaware.